To paraphrase Charles Dickens: It was the best of times, it was the worst of times. 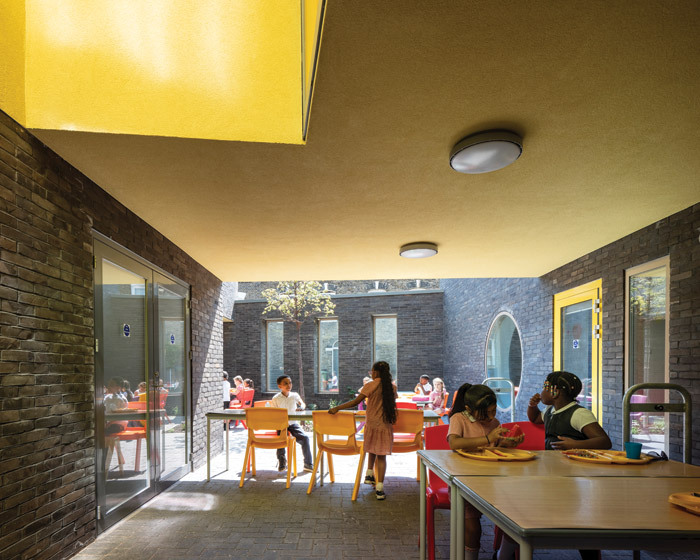 2008 was a point when many of the UK’s most innovative and civic-minded architects had enjoyed several years of funding and encouragement to radically improve the buildings that housed the nation’s school children. Sometimes extraordinary, often uplifting, daylight-filled, legible and welcoming buildings popped up in some of the most deprived boroughs around the UK, thanks to the then Labour Government’s Building Schools for the Future (BSF) programme and its policy of putting funding first into the worst-performing educational areas. 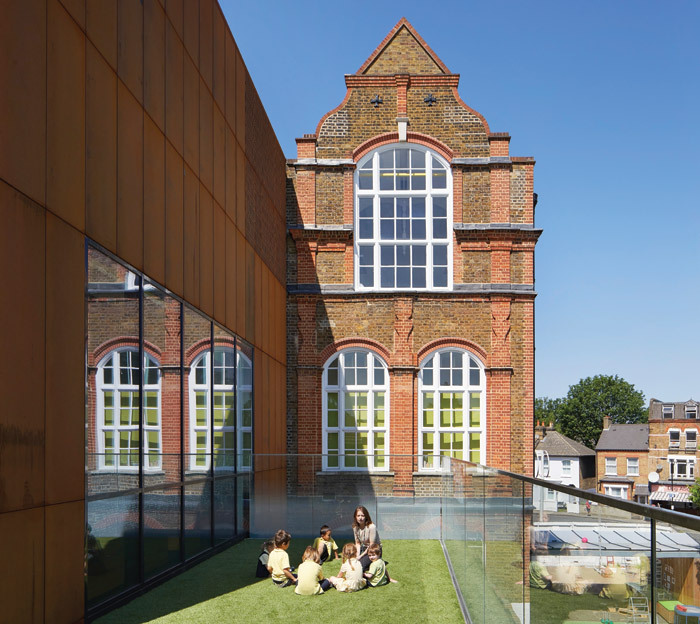 Major accolades went to dRMM for its work, completed in 2007, at Kingsdale Foundation School in Dulwich. Fringed by some of the UK’s most elite private schools, it had long been afflicted with terrible results and challenging behaviour. Following on from an in-depth examination by the Design Council’s Schoolworks programme into how school architecture could impact positively on behaviour, morale and learning standards, new interventions and buildings designed by dRMM played a major part in transforming this school into one of region’s most sought after and successful. School architecture was on a roll. The following year, the ultimate architectural accolade – a Stirling prize nomination – went to AHMM’s Westminster Academy. But in that same year, global recession hit, impacting massively on public spending. In 2010, the Labour government limped out of power and the new Conservative-Lib Dem coalition education minister Michael Gove accused school architects of ‘creaming off fees’. ‘No one is here to make architects richer,’ he declared, promptly scrapping the £55bn schools building programme in favour of a still deeply controversial programme the PSBP scheme (Priority School Building Programme), which sought standardised, cheap and quick solutions to patch up a crumbling system. The result? 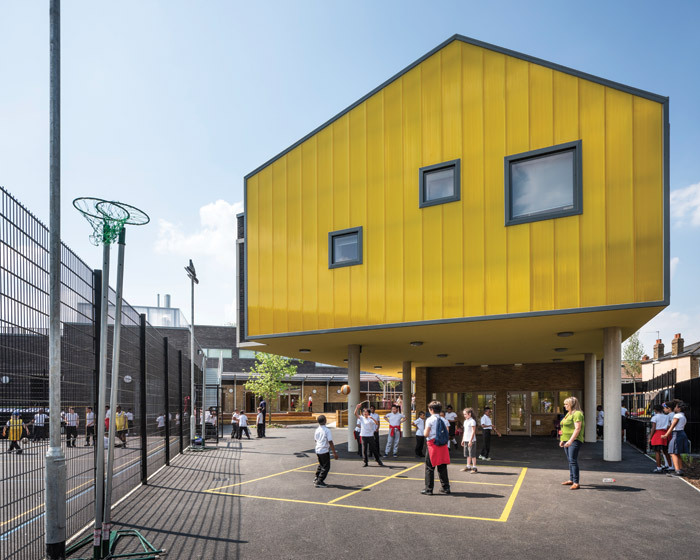 A 2016 RIBA report declared that a 60 per cent reduction in the schools capital budget was ‘producing a new generation of overly standardised new buildings which cost £150m a year more to run than they should’. The report concluded that ‘too many pupils and teachers are struggling to learn and teach in conditions damaging to their health and education’. But against this backdrop there are glimmers of hope. In certain regions and under the guidance of progressive local councils, enlightened school leaders coupled with resourceful and clever architects, the sector appears to have regained confidence, with new capital projects justified by the late Noughties’ baby boom and the pressure that this is bringing to bear on existing school places, both primary and secondary. Perhaps the definitive marker of continuing commitment to excellence in school architecture – despite the prevailing political wind – came in 2015, when AHMM won that coveted Stirling Prize for the six new buildings it had added to the campus of Burntwood School, a modernist Fifties’ London school for girls, now an academy. Since then the sector appears to have gained momentum as more new schools emerge that are innovative, space-savvy, and socially and environmentally friendly. Use of space is never more contentious than in the most densely occupied parts of big cities. Which makes Cottrell & Vermeulen Architects’ achievement all the more remarkable: in creating a new building for the long-standing Bellenden primary school in Peckham on a site smaller than the original school’s footprint, it has managed to double capacity from one to two-form entry while sacrificing none of the outdoor space allocation, and creating a bright, airy and uplifting school, both inside and out. Parked on an island site – formerly occupied by a small and dilapidated Seventies’ Southwark-run care home – surrounded by residential housing ranging from Victorian terraces to mid-20th-century council houses and flats, Cottrell & Vermeulen’s scheme had to be incredibly sensitive to its neighbouring population, in scale, orientation and massing. This it achieves by breaking down the facade into two-storey, house-sized blocks and, furthermore, subtly reflecting the variety of eras and styles in the adjacent terraces through gently mimicking windows, colour and detailing of bricks, the angling of roof lines and the presence of chimneys (which in this case are part of the passive ventilation system, drawing cool or warm air through the building, as required). Its grey-brick boundary wall reflects but also contrasts playfully with nearby garden walls, adding in slabs of bright, red and yellow polycarbonate panelling. In this way, the scheme manages to combine being protective of its inhabitants (eventually 420 children) and respectful of its neighbours while offering pleasing civic flourishes that one can see will make it a real asset to the community. For further evidence of this commitment to quality Cottrell points out other architects currently completing or about to complete Southwark schools, including Maccreanor Lavington (Grange Primary School), Feilden Clegg Bradley Studios (Charter School), and Haverstock Architects, which, in Belham School, has brought a handsome Victorian school building back to life, and enriched it with an elegant new extension. Where the most notable new schools bring an uplifting element to their communities – both outside and in – there is very little experimentation with classroom and school typologies of the kind that we saw during the BSF years. Some were swept up in visions of tech-assisted, open-plan spaces that looked more like advertising agencies than places to educate children. 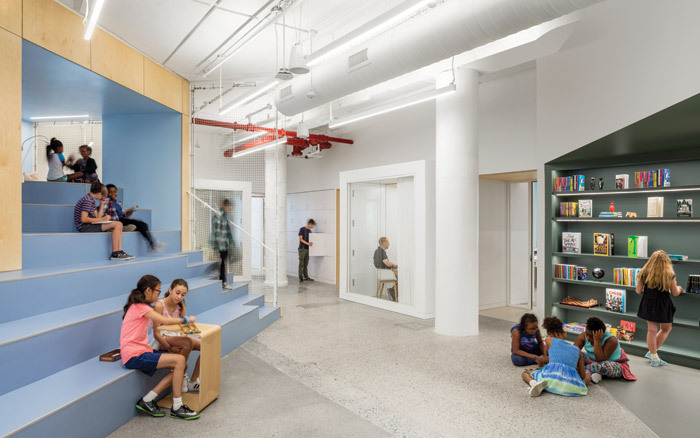 Even the most tech-savvy of educators now seems to realise that large, open-plan spaces with little or no respite were not the way everyone learns best, as AltSchool, set up by a former Google employee, demonstrates (see case study). However, the kind of staffing investment and ratio required to run a school as bespoke as this has taken its toll – Business Insider reported at the end of 2017 that two AltSchools had closed (though not the one featured here), as the $27,000 a year fee per pupil for tuition doesn’t cover the programme’s $40m a year costs. But what about other elements of performance, like environmental? There was also a movement during the BSF years towards ever more sophisticated building management systems, many of which failed to deliver, either because nobody within the school staff understood how to operate them, or because they required expensive and regular maintenance that normal tight school budgets cannot run to. Current school-design thinking, he says, ‘has been very much guided by spreadsheets and costs,’ and what the CIBSE research group is trying to do is look at quality and longevity of design. Longevity means flexibility, he says. The space standards guidelines are a straitjacket, he says (though Bellingham school demonstrates you can find a little wiggle room with an understanding client and a smart architect). ‘There’s no fat in it whatsoever, no flexibility for future adaptation. And with modular construction that situation is going to be even further exacerbated. The best thing about BSF was that future flexibility,’ he concludes. 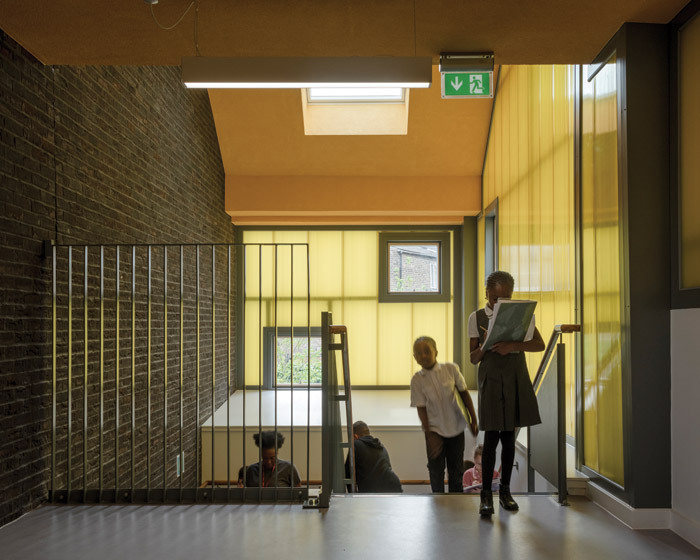 Set within a tight grid of residential streets in Peckham, Cottrell & Vermeulen has created a civic and colourful new building for Bellenden Primary School, doubling the pupil provision within the same footprint of the previous, single-storey school without sacrificing any outdoor space. There are two openings in its grey brick U-shaped boundary wall: one welcomes nursery children to their own dedicated entrance play area, while infants and juniors enter a wide, cheerful lobby with views on to the play space at the heart of the site. But the welcome starts long before children reach the front door, thanks to the school’s curved contours, the way its sections mimic the proportions and materials of the surrounding houses; not to forget the portholes and bright, red and yellow polycarbonate panelling arranged along the school facade. 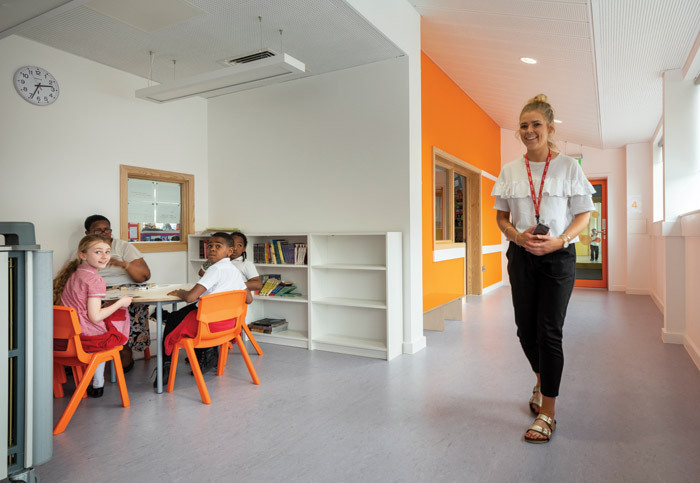 Director Richard Cottrell says: ‘Everything on a school design brief unfortunately is about minimum area: you get given an area (per classroom, corridors, entrance) and you have to work to that.’ C+V has managed to appropriate space from some areas to give it back where it counts. 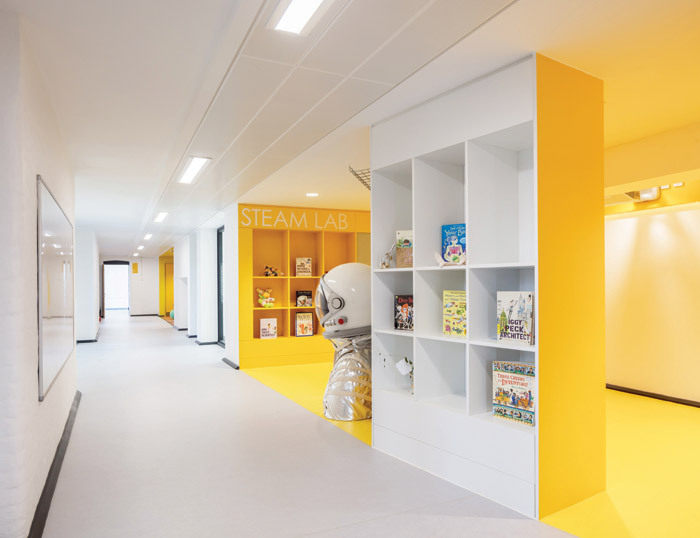 For example, to cut down on corridors, classrooms are arranged in pairs, by year group, separated by four staircases via which children flow easily and quickly down to or up from the playground; these stair points are flagged up by the yellow polycarbonate sections. By making these staircases effectively open to the outdoors – therefore outdoor space – they fall outside of the design brief’s space restrictions. But these glowing yellow beacons are far from utilitarian, with square windows cut into the panelling so children have views out on to the street and the city beyond. Within the building large, ash-framed windows give into each classroom from each short stretch of corridor, with ample daylight from views into the central playground. In this way the classrooms’ compact dimensions feel anything but. Doubling up usage brings more square footage to key areas: for example, the dining hall can be used for assembly and games (a sliding wooden door separates it from the kitchen), and opens on to an external dining courtyard. A well-equipped music room sits off of the same courtyard, creating a discreet space for open air or indoor lessons. This section can be accessed separately and used as a music school at weekends. Sheltered play space is also offered (and external space maximised) thanks to an undercroft beneath one series of classrooms. The exterior spaces are animated by the colour in the building, plus complementary murals and mazes added to the Tarmac; bird boxes, 23 mature trees and planting adds to the charm of this new school, while additional planted roof terracing occurs at various points along the first floor, which can be used for teaching. AltSchool is an educational start-up, founded by former Google executive Max Ventilla in 2013. Its ‘lab schools’ format has been devised by a group of educators and technologists to provide ‘learner-centric’ education. The first school opened in San Francisco in 2013, with another in New York’s Brooklyn Heights shortly after. The principles are to ‘streamline classroom operations’ and use tools, from technology to design, to help educators support each child’s personal learning style. Opening last year, the newest, Manhattan iteration takes this design plus technology brief to a new level, thanks to a scheme by New York based practice Architecture + Information (A+I), whose clients are more typically tech and media companies in New York and LA. Designed after close consultation between students, the school principal, architects and strategists, the scheme occupies the entire floor-plate of an 11-storey stone building dating back to 1903, near Manhattan’s Union Square. Designed to be ‘playful but not childish’, each space can accommodate larger and smaller group learning as well as individual learning. At the heart of the scheme is an agora, designed for gatherings, presentations, performances and events. 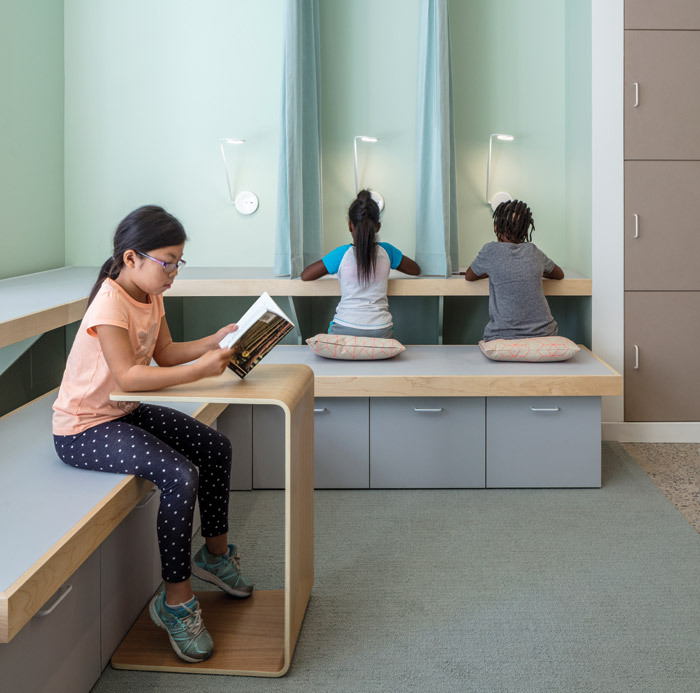 A blue stepped seating area includes small nooks for children to read or study in. Immediately off this space is a Design Lab, an open-plan area with free-standing tables and chairs that can be reconfigured to accommodate everything from individual or group arts and crafts activities to large-scale science experiments. It is also used as a computer lab and lunch hall and play space. Around the perimeter of these two core areas are classrooms that link to one another so that they can open up or close down according to the school’s needs. Between these classrooms is a ‘flex room’, which doubles up as breakout space or small group study zone. Smaller, soundproofed glass booths are located around the floorplan to offer meeting space for teachers and parents, or individual focused study. ‘The common theme is choice,’ says A+I cofounder Brad Zizmor. Tackable panels on all millwork doors turn storage space into additional presentation space, for pinning-up and presenting work. Colour clearly indicates activities, with darker tones flagging up quiet, reflective spaces, and lighter pastels for focused group teaching areas, while bolder colours are deployed to signify areas for noisier collaboration and engagement. These highlight colours stand out against a neutral palette in the main areas, including concrete flooring and wooden wall panels. A handsome, three-storey, Grade II listed Victorian school (from around 1875) has been brought bang up to 21st-century standards with an inspired refurbishment and extension by Haverstock. 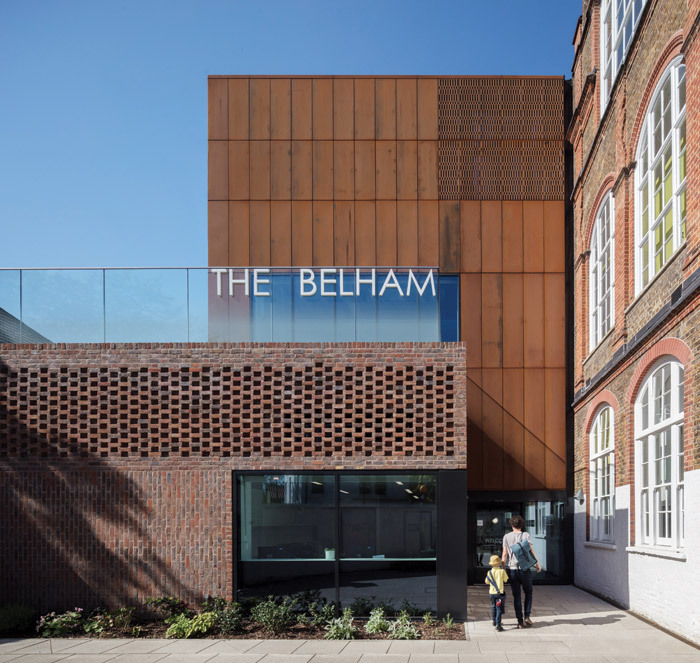 Opening early in 2018, the Belham Primary School project took nearly four years to complete, thanks to painstaking conservation work, which entailed repointing much of the brickwork, completely reconstructing the roof and drying out the damp-saturated building. With strict conservation requirements and the sensitivity of being surrounded by residential streets, the brief was that any new elements had to be ‘visually subservient’, according to Lee. ‘The old school is the jewel,’ he says, ‘but everyone wanted a strong identity and a landmark.’ Haverstock found an ingenious way to add vital assembly and dining space, plus teaching, meeting and event space with an extension built into a rear yard on the ground-floor level, now occupied by a new L-shaped dining and assembly hall. On top of this perches a two-storey cube, clad in corten steel whose rusty hues tone nicely with the Victorian brick. A new atrium stairwell next to the cube now provides internal circulation. External access to this cube is via a wide staircase (that can also act as seating) to the rear of the newly refurbished playground. Here, a fake-turfed terrace offers an additional play deck or congregation space for event participants to admire the view from the glazed balcony down on the predominantly Victorian neighbourhood – the cube is available as a third-party event space. 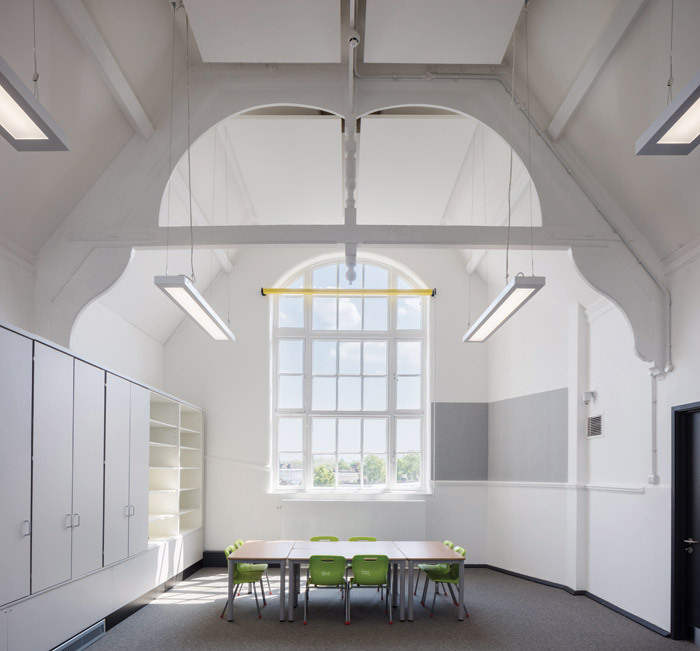 The school’s interiors feel light and airy, thanks to white paint on the brickwork, punching out false ceilings and partitions to expose the original scale of rooms and their enormous windows. A huge amount of acoustic work has gone into ensuring that these tall, brick-walled spaces are not too resonant. For example, on the ground floor, white acoustic fins bring a sculptural element to the new refectory/ assembly space. Daylight pours into the deepest parts of the building from original glazed doors along the corridors, which have been stripped back and restored, their joinery picked out in darker paintwork. Generous storage keeps the compact classrooms relatively clutter free, while on the first and second floors, where corridors are wider than standard, two corridor zones have been turned into breakout spaces, called Creative Resource and Artifact Zones for each key stage; juniors occupy the second floor, infants the first, while reception has its own separate entrance and play space, and takes up most of the ground floor. Though the new interventions had to be subtle, there are some uplifting touches: triangulated roof lights at the top of the atrium ensure the rear roof gable isn’t compromised by the height of the new structure; and perforations in the corten steel panels bring attractive shadowing into the office and staff space on the second floor and maintain privacy for neighbours. A DT and cooking room (on the first floor) is much larger than the usual classrooms, and doubles up as afterschool activity space. A huge music room on the second floor features spectacular 4m-high windows, and original timber trusses have been exposed, creating a most dramatic and characterful teaching space. Thanks to shared funding from the Education Standards and Funding Agency programme and Southwark Council, the scheme has been completed to the highest standards. This investment will hopefully be repaid with a school that lasts well into the next century. 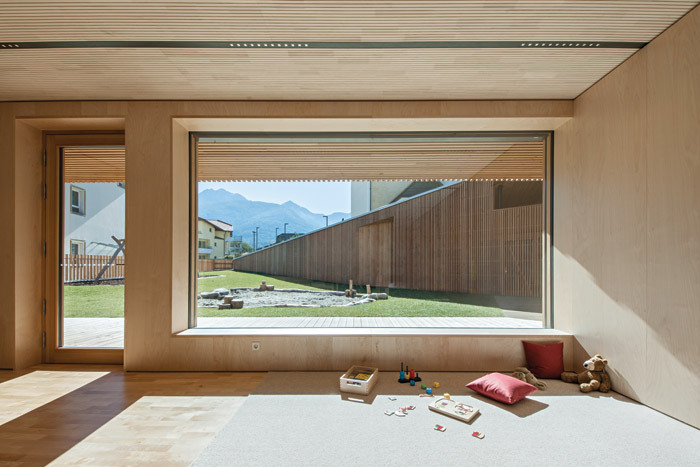 Embedded into the natural landscape of the South Tyrol, feld72’s Kindergarten Niederolang in the Italian village of Valdaora di Sotto forms its own secure but friendly landscape, with a sculptural, white rendered exterior wall transforming into a wood-clad interior courtyard, folding in on itself at varied angles and scales to create layered outdoor play spaces at its centre. 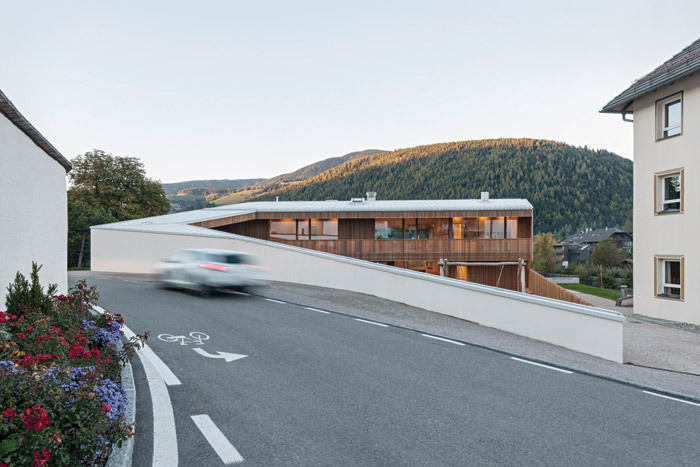 The form of the building responds to its sloping site as well as the dominant structures in the town – the parish church, the cemetery chapel and the elementary school in the village centre. Winning this project at competition, the architects – for whom this is the third kindergarten – were inspired by the way in which boundaries and fences delineate the fabric of these small mountain villages, evolving over time in response to population and usage and shifts. 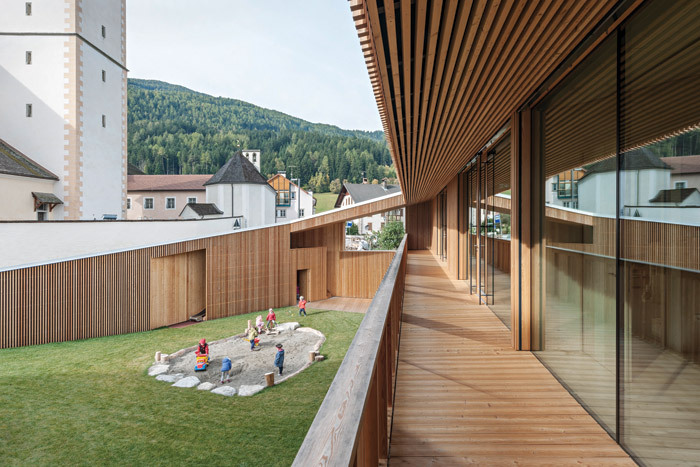 In the same way, the kindergarten’s exterior wall ranges in materiality and volume from garden fence scale to boundary wall, depending on the programme of the building. The uniform timber cladding across the interior courtyard structures gives a warm and sculptural quality, somewhere between chalet and adventure playground. The same timber treatment is used on canopies to provide weather protection over terraces. Inside the school, rendered masonry and simple panels made from local wood create a sense of unity with the surroundings. Classrooms flow in an open and multifunctional procession. Group rooms near the entrance represent the start of the pupils’ day, and can be sealed off to become community event space. Further in, classrooms, filled with natural daylight, provide areas of engagement and retreat thanks to large window recesses and accessible partition furniture. Rooms can be opened up to create one connecting flow or separated, as required, giving this traditional village a supremely flexible, contemporary education space respectful of the community and its traditions.